The rapid spread of computers and mobile phones has brought a new problem to Nepal’s already mismanaged and overburdened garbage disposal system: disposal of e-waste. Imports of computers, mobiles phones and other electronic gadgets topped Rs 250 billion last year, making up seven per cent of the total import bill. The number of SIM cards in use in Nepal has now overtaken the country’s population of 28.8 million. More than half the population has access to the Internet. The disposal of electronic devices with toxic components poses a challenge in many developing countries which have been dumping grounds for hazardous electronic waste from Europe. But poorer countries are now generating their own e-waste, and do not have the disposal safeguards that the West has in place. 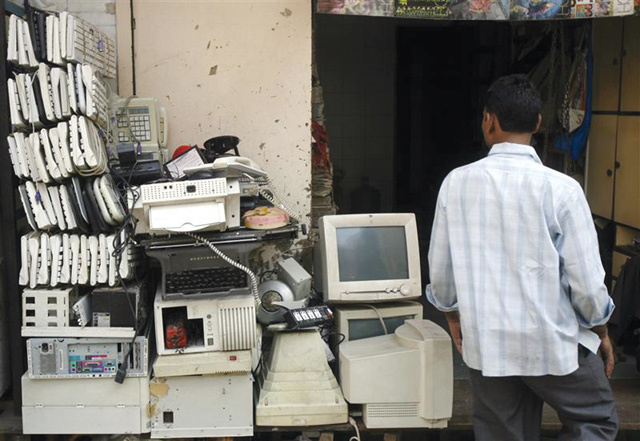 “The number of consumers is growing rapidly, and it is high time we addressed the problem of e-waste,” says Min Prasad Aryal, spokesperson at the Nepal Telecommunication Authority (NTA). 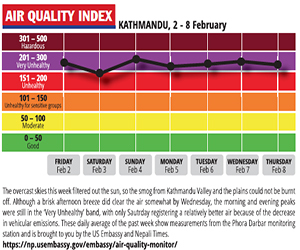 Nepal’s laws on environmental protection, including the 1997 Environment Protection Act, which states the general goal of ‘making legal provisions to maintain clean and healthy environment’ has no guidelines, solutions or even recognition of electronic waste. Cathode ray monitors have an average of 2 kg of lead in them, mobile phones have rare metals, and other consumer electronic devices have hazardous material. As e-waste mixes with solid waste in landfills, heavy metals can leach into ground water sources. The NTA report recommends that the government create definitive regulations and directives, define roles and responsibilities, launch awareness programs, formulate a stricter registration and authorisation mechanism for electronic goods and establish a fund for e-waste management. 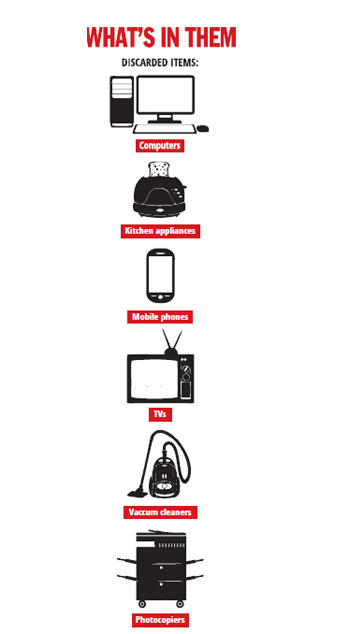 An NTA study has divided electronic equipment into 89 broad groups which include electronic gadgets, kitchen appliances, to vacuum cleaners, washing/photocopying machines and their parts. These gadgets contain at least 15 hazardous elements and toxic heavy metals including antimony trioxide, arsenic, beryllium, cadmium, chlorofluorocarbons, chromium, cobalt, lead, lithium, mercury, nickel, polybrominated flame retardants, polyvinyl chloride, selenium and zinc. Scavengers do pick up metals for recycling, but they are not interested in the most toxic of the components. “We collect copper, brass, steel, tin and plastic,” says Rajesh Jaiswal, the proprietor of Lakshyabar Mai Ki Jay, a scrap trading firm at Lalitpur. A lethal component of e-waste is acid in old batteries. Although scavengers take the lead for recycling, the acid is just poured out, where it seeps to the underground water table. 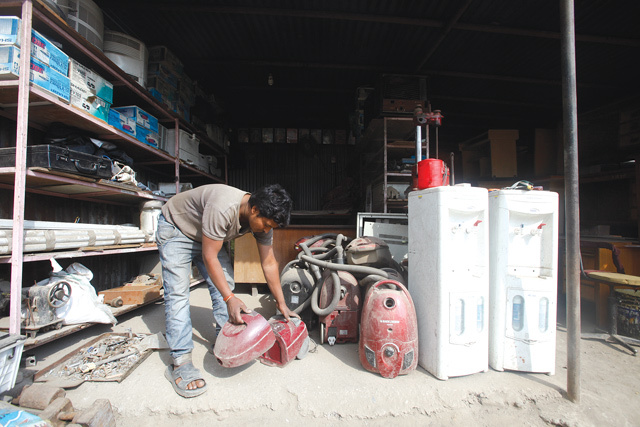 “For mobile batteries, cracked monitors and other items we have hired a garbage collector who disposes of them in the municipality landfill,” says Shambhu Saran of Rautahat who runs a scrap store at Sanepa. Bishnu Thakali of the Women Environment Preservation Committee confirms that e-waste is treated like the rest of the garbage, dumped into the river or its banks. She says: “This has dangerous impact on public health and environment” According to the NTA study, most of the toxic e-wastes are carcinogenic, and pose health risks to humans with repercussions on cardio-vascular diseases, inflammations, skin diseases, birth defects, etc. Currently, plastic parts, copper wire and metals from abandoned electronics are removed and sold to scavenger groups for recycling in Nepal and India. As there is no recycling unit for e-waste in the formal sector in Nepal, scraps that aren’t reused are piling up in municipal dumps or are just discarded. To play Nepals stock market, forget all you know about profits, losses and balance sheets. The 12-point agreement between the Maoists and the seven-party alliance as listed in statement by Pushpa Kamal Dahal on Tuesday.